All this week we have been sharing summer craft ideas using mason jars. We have actually been running this series for a few years now and have amassed over 90 ideas in total. That means that if you are a mason jar lover, this is definitely the post for you! Grab your jars and get crafty this summer with a few of these ideas. They are sure to put a smile on everyone’s face! I am embedding the collection below. Each craft idea will appear as a small picture below. Just click the ones that you want to see and they will open in a new tab on your computer. Each is complete with instructions so you can easily make them yourself. Then you can just bookmark, pin, or print the ones that you want to make this summer! Happy crafting y’all! So, tell us, which of these ideas is your favorite? I am having a hard time deciding myself. So many great ideas and so little time! You might just find enough time during the summer to try all of these great ideas or perhaps just a few. Either way, be sure to spend a little time this summer getting creative (whether or not it is with mason jars). Use these summer craft ideas to express your creativity as it is a great way to relax! Want to have some fun with mason jars this summer but not sure about doing any crafts? You can also try purchasing some fun summer themed jars from Amazon. I am embedding a shopping widget below with a few ideas for you. Remember that these links are affiliate links which means that you do not pay anymore, however, I will earn a small commission from any purchase. 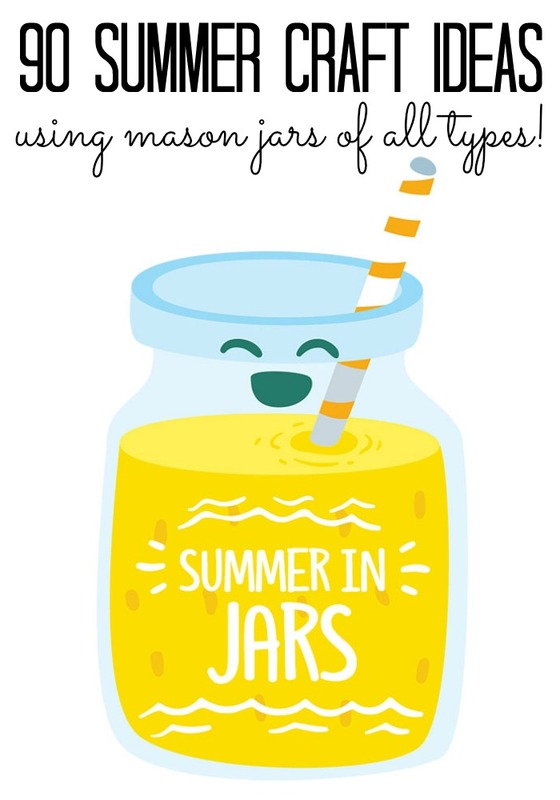 Y’all enjoy these summer jar ideas as well! My very favorite is the copper-painted jars hanging on the wood plaques, and almost a first are the picnic jars. I want to have an impromptu lunch for some friends using the mason jar salads!